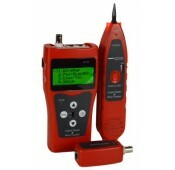 Trace, check length to 1200 feet, and test CAT5/5e/6/6a/7 cable for open circuits, short circuits and cross connections. 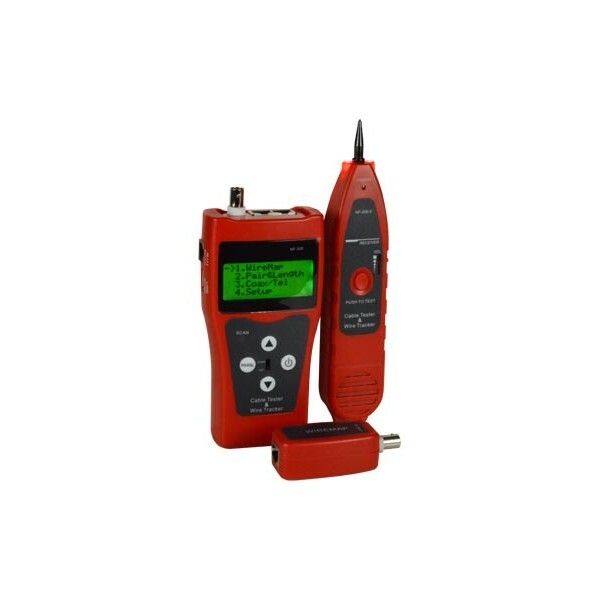 The TESTER-CABLE-LG1200 Cable Length Tester can determine the length of CAT5/5e/6/6a/7 cable up to 1,200 feet (350 meters) and check for wiring errors such as open circuits, short circuits and cross connections. The unit can also trace CAT5/5e/6/6a/7, telephone line, coaxial and USB cables. One person can check both ends of installed wiring with remote and local units. Find length of CAT5/5e/6/6a/7 cable up to 1,200 ft (350 m). Test CAT5/5e/6/6a/7 cables for errors such as open circuits, short circuits and cross connections. Trace CAT5/5e/6/6a/7, telephone line, coaxial and USB cables with audible wire tracker receiver. Portable unit with long battery life. Automatic time-delay shut off and back-light display function. Far-end recognizer with prompting audio when connected to local unit. Self-checking function automatically compensates for any change in battery capacity or ambient temperature. Three RJ45 connectors to test, trace and loopback CAT5/5e/6/6a/7 cable. One RJ11 connector to trace telephone line cable. One BNC connector to trace coaxial cable. One USB port to trace USB cable. One 3.5 mm audio jack for listening to tracing alert. One 9V battery each for local and remote unit (not included).